Meet the authors. Find out why we did this. If we leave ego and organizational affiliation out of the equation, together we can solve almost anything that confronts America. That's the thought that kept hitting me as I read "Boundary Spanning In Practice". Today's leaders regardless of political affiliation, organizational paycheck or professional credentials need to become skilled in reaching across boundaries in order to solve the complex, idiosyncratic, and systemic issues that confront us today. There are no easy answers. The best answers are those that arise from embracing complexity, letting go the notion that there is a quick fix, and those that acknowledge that nobody has the perfect answer --- but that enough of us acting together for a common goal can come up with a workable answer. This book is a big step forward in helping those who seek to govern do so in a better, more effective manner. I really like the language, clearly you guys want humans to read your stuff. How about that?! I'm looking forward to printing it and reading it carefully. 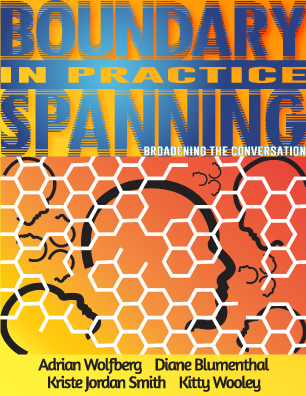 'Boundary Spanning In Practice' brings organizational research down to earth through the experiences and analysis of the career civil servants who bring their life’s work to the text. So often, books about management, leadership, and organizational development and improvement fail to connect with the on the ground realities of public service. This book stands alone as a practical guide to improving personal and organizational performance based on the authors’ well-sourced research and decades of collective experience in the federal Government. A fantastic ebook if you want to learn more about boundary spanning and cross-functional working, kindly shared by Kitty Wooley. Kitty emphasises how in a more complex and uncertain environment, organisations need to break down silo boundaries to adapt and change employee behaviours in order to grow and innovate. Too much control and structure perpetuates an inability to contribute to a wider community, expand skills, enable knowledge transfer and truly work together towards a common goal or purpose. In addition, Adrian Wolfberg contributes his case study and expertise to expand on the conversation, emphasising the importance of the need for interaction at the intersections of boundaries whether physical or not so the ‘design-level strategy’ and ‘street-level strategy’ are connected. This is not about leaders abdicating responsibility but enabling employees to be empowered to drive change with leaders as sponsors and contributors. The outcome in an effective boundary spanning environment is increased innovation and creative thought, a feeling of being inspired and ‘part of something’ as well as feeling valued. It also increases the likelihood of successful, sustainable change for the better of the organisation as a whole. This complimentary ebook on various aspects of boundary spanning was produced collaboratively and published on 9/3/17 by four writers and a graphic designer who created the cover, each of whom is a Senior Fellow or Friend. Connect with us on LinkedIn or via kittywooley5 [at] gmail [dot] com. The ebook is licensed under a Creative Commons Attribution-NonCommercial-NoDerivatives 4.0 International License.